After the success of my previous SPB Shell v3.7.1 post, Now I am back with a New version of SPB Shell software for Symbian devices. This version of the software supports all S60V5 devices and Symbian^3 devices. Symbian^3 Users can also enjoy the SPB Shell 3D, Which much better than this version, Check out this post for SPB Shell 3D. SPB Shell is mobile launcher software, With SPB Shell you can customize your Homescreen and menus as per your requirement. for example, Suppose you do a lot of Social networking then you can Add facebook, twitter widgets on homescreen to all Updates without launching Applications. SPB Shell can be Modified using custom skins, I've posted a lot of custom skins, So you can enjoy different OS experience on you Nokia device. 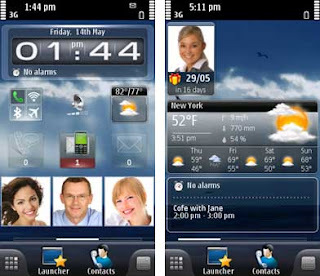 To start you can change your nokia device into an iPhone UI or HTC Desire UI or Symbian^3 UI and much more. So coming back to SPB Shell, Here is the New SPB Shell v3.8 with Registration Code. This software supports all S^3 and S^1 (S60V5) devices and Runs smoothly. After Downloading this SIS file, Copy It in your Phone and Install it. Please Guys, If you like this post, then do share it with your friends and others.